Beautiful old Bollywood movie poster of the hit Hindi film Pakeezah (1972) for sale. 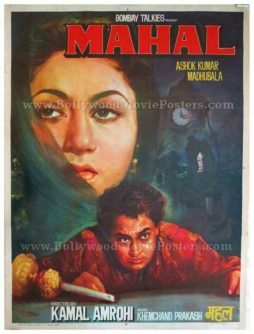 This is an actual vintage poster of the 1972 epic film directed by perfectionist Kamal Amrohi that won critical acclaim and is remembered till date for its memorable footprint on the history of Indian cinema. Pakeezah reportedly took 14 years to make due to the separation between lead actress Meena Kumari (Tragedy Queen of Bollywood) and director Kamal Amrohi in 1964. The two decided to separate after twelve years of marriage, leaving the film stalled midway. The film was reportedly restarted in 1969 and finally completed in 1972. Printed and circulated several years after the first release of the film (somewhere in the 1980s/1990s), this movie poster was originally designed for publicity of the re-release of the film but never ended up being used. In the poster, the lead protagonist of the film, Meena Kumari is seen in her spectacular best in an iconic dancing pose. This scene is captured through a still photograph from the film, which has been pasted on to the poster. A small cut out of the lead actor Raaj Kumar is seen on the bottom. 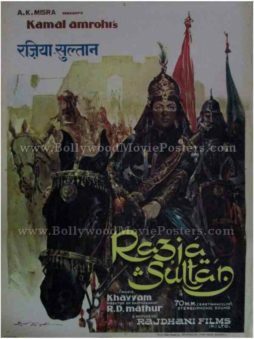 The typography used in this poster is in English, with the title translated in Devanagari Hindi as well as Urdu. Pakeezah (Pure) is a 1972 hit Hindi film, written and directed by Kamal Amrohi, which tells the story of a prostitute with a pure heart. Tragedy Queen of Bollywood, Meena Kumari played the lead role in the film. The film’s music composed by Naushad went on to become a rage throughout the nation. In particular, “Chalte Chalte” & “Inhi Logon Ne” sung by Lata Mangeshkar are considered all time classics and played till today.